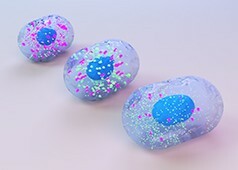 Mechanobiology describes the relationship between a cell and its environment; how a cell can detect, measure and respond to the rigidity of its substrate and how these processes apply to larger biological systems. 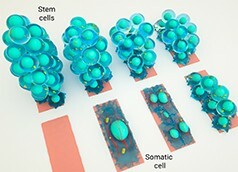 As the field of mechanobiology developed, several common themes applicable to various cell types and biological systems were described. 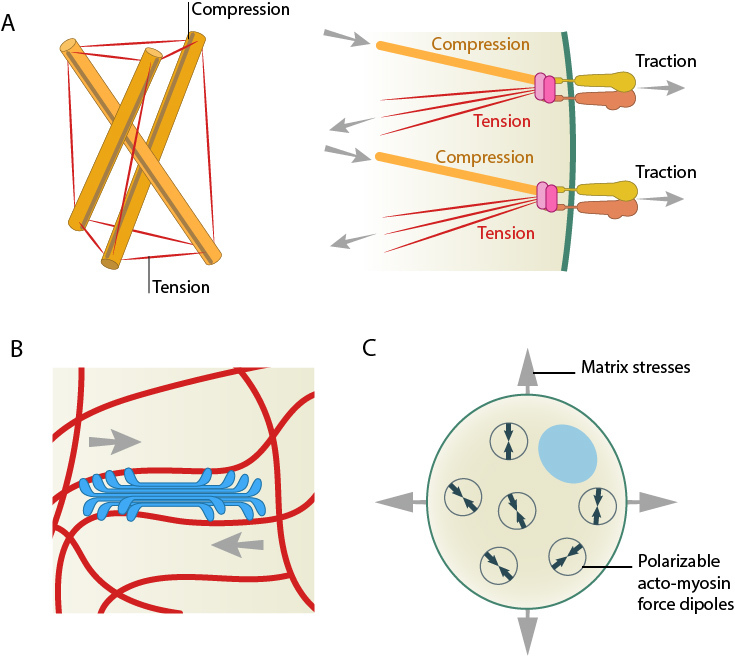 Models for force-induced modulation of cytoskeletal stiffness. (A) Tensegrity model: Top left- A simplified version with compression struts and tensed cables exemplifying that stress levels regulate cytoskeletal rigidity. 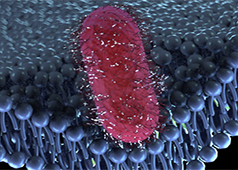 Top right- In the cellular context, microtubules (gold rod) apply compression on cell-matrix adhesions (represented by actin linking modules in pink and integrin dimers) while the actin filaments (red) experience the cellular tension and hence stiffen accordingly. 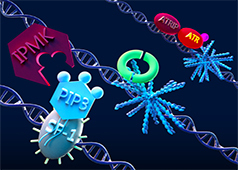 (B) Semiflexible chain model is represented by the flexible actin cables (red) that locally rigidify at points of stress application i.e. 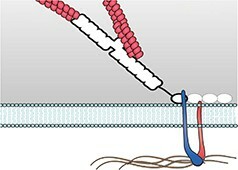 myosin (blue bundle) contraction. (C) Dipole polarization model: Formation of contractile actomyosin dipoles is symbolically represented by the arrow pairs. According to this model, they freely orient in response to applied stress as experienced at a particular point. Adapted from Stamenovic D. & Ingber DE. 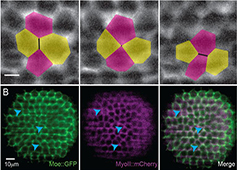 Tensegrity-guided self assembly: from molecules to living cells. Soft Matter 2009; 5:1137–45. 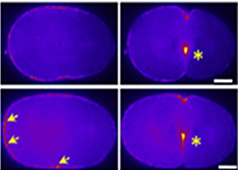 [DOI: 10.1039/B903916N] and [PMID 20816234]. i) Tensegrity: This model states that pre-existing tension within the architecture of both the cytoskeleton and the extracellular matrix (ECM) determines cytoskeletal rigidity upon the application of load (stress), such that stress is proportional to rigidity. 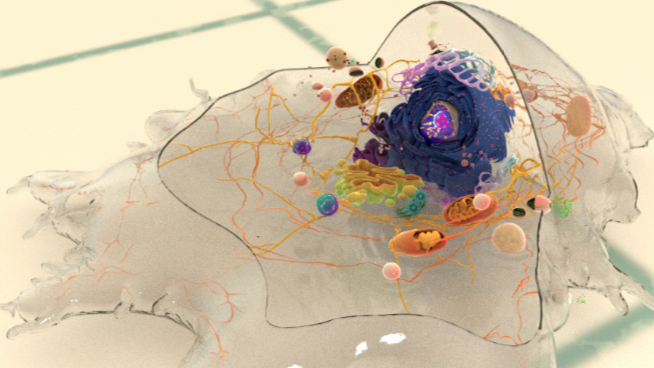 This model assumes the cytoskeleton acts as a network of tensed cables interspersed by soft cellular material ,,. 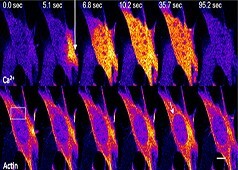 These cables tense and pull in response to an applied force in order to regain cellular stability. ii) Semiflexible chain: On the assumption that actomyosin filaments are distributed uniformly throughout the cell, this model states that the filaments are non-linearly elastic (similar to cytosol) and stiffen under stress. Hence, actomyosin filaments can be defined as semi-flexible structures, which are suggested to respond to force isotropically i.e. uniformly throughout their structure irrespective of the directionality of the force applied ,,. iii) Dipole polarization: On the assumption that actomyosin filaments are distributed uniformly throughout the cell, this model states that upon the application of force, the elastic filaments form dipoles. 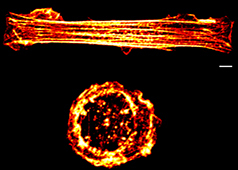 These dipoles propogate force through the cytoskeletal network through polarization and subsequent pulling on the filaments in direction-dependent manner. 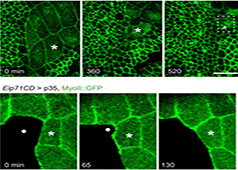 Hence, actomyosin filaments are suggested to respond to force anisotropically i.e. differentially throughout their structure dependent on the direction of the force applied ,,.